Infection with certain types of human papillomavirus (HPV) is associated with various cancers. Researchers are working to understand the processes by which HPV can transform a healthy cell into a cancerous one. 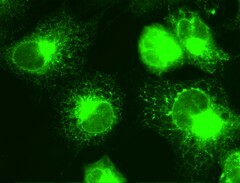 This image shows COS cells stably expressing HPV-16 E5 oncoprotein (green). E5 localizes predominantly to the membranes of the endoplasmic reticulum (ER).